The Memorial Hall was erected in memory of those who died in service or were killed in action during World War One. The Returned Soldiers and Sailors Imperial League of Australia was formed in 1916 and a branch opened in Ipswich in September 1917. As the end of the war approached in 1918, the Ipswich branch requested land suitable for a building which could be a recreation hall and war memorial. 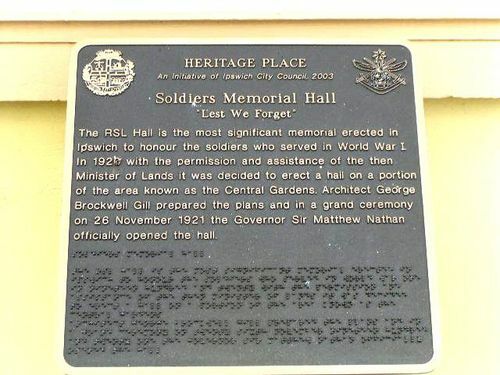 The Memorial Hall was funded by Ipswich City Council and public fund-raising. When originally built, it contained the School of Arts library, recreation facilities for returned soldiers, offices for the RSSAILA and associated organisations and a memorial 'crypt' or honour chamber. The foundation stone for the hall which was erected on the site of the old pump yard in Central Gardens in Nicholas Street was laid by General Sir W.R. Birdwood K.C., C.M.G., on the 4th May 1920. The official opening ceremony was performed by the Governor of Queensland, Sir Matthew Nathan on the 26th November 1921. Queensland Times, Ipswich 20th October & 28th November 1921. And Country In The Great War 1914 - 1918. GENERAL SIR W.R BIRDWOOD Bt.G.C.M.G.